A gift for the boss, who's very much into IT. 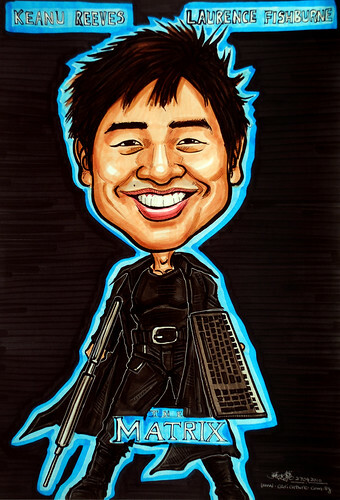 The client came out with a draft, with him holding a gun and a keybaord, and in a outfit like in the movie "The Matrix". He also requested for those special effects which he has attached. However, there's a limitation of what colour markers can do. I counter-proposed a black background which will look better too, and he agreed with it. "Thanks for the caricature. The Matrix outfit was really cool. Yes, you're right about the black background - it's simple and appropriate."